Competitive Edge Products, Inc are delighted to offer the brilliant [Model 60018] Brighton Lifetime 8' X 10' Storage Shed Added Value: 1 - 90" Shelf, 6 Corner Shelves, 2-pk Peg Strips. Lifetime's storage sheds are attractive, durable, and weather resistant. Constructed from double-walled, high-density polyethylene with steel reinforcements. No painting necessary. Won't fade, rust, or dent like other sheds. Lifetime is the name to trust when it comes to storage sheds in Utah. Lifetime storage sheds are not only designed for durability, but are an attractive addition to your yard. Check out Lifetime back yards, you’ll find many Lifetime storage sheds in Utah! Lifetime sheds have to be weather-resistant to heavy snows in winter and UV-protected during our sunny hot summers. Our durable Lifetime storage shed is constructed from high-density polyethylene (HDPE) plastic and powder-coated steel to meet those needs. No rusting. No cracking. No fading with the lifetime sheds product line. 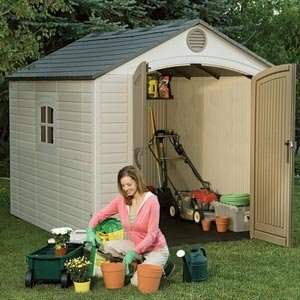 An attractive, low-maintenance shed that never needs painting. 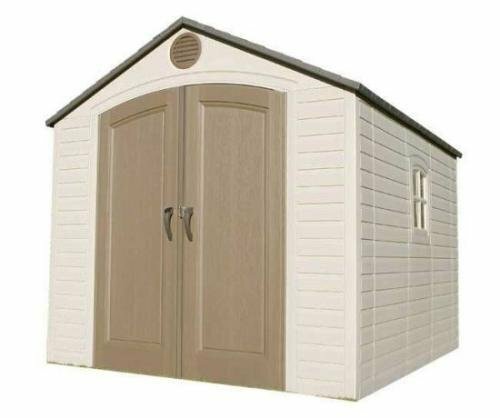 The lifetime sheds are made in the USA from US and imported parts. Covered by a 10 yr. limited factory warranty. Compatible with our 8 ft expansion kits. View more lifetime sheds here. View YouTube Video "Lifetime 8 x 10 Foot Outdoor Storage Shed (Model 60018)"
View YouTube Video "Lifetime Outdoor Shed - Review"
View YouTube Video "How to Install the Roof for a Lifetime Shed"
Watch this video to learn how to install the roof on a Lifetime shed. View YouTube Video "How to Install the Floor and Wall for a Lifetime Horizontal Shed"